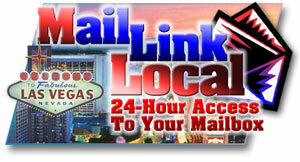 If you live in or near Las Vegas, or are a frequent visitor, Maillink Local Mailbox Rental is for you. Convenient Location, just a 15 minute drive from the Las Vegas Strip, and 20 minutes from McCarran International Airport. Optional 24-hour Service*. Access your mailbox anytime, night or day, and even on the weekends. Safe and Secure - 24-hour Surveilance. No Hassle. In and out with no delay. Shipping and Packing Service for when you need to send out large packages. We offer many services to our local customers, as well as visitors to Las Vegas. We are your one-stop store for all your needs. Toll Free at: (888) 267-1109.